I found a good deal on a 60W equivalent bulb to replace the CFL I was using in the dark hallway of the house. I was surprised at the amount of light it gives. It is one of those ice cream cone configured bulbs, inverted in an enclosed fixture. It also doesn't seem to be RFI noisy. I had bought a photo controlled LED night light that put RFI all over the shortwave dial. Good light output though. That will be a hand me down for my sister and niece's family. I have a torchiere lamp with a very large upright CFL that I use as the "are they at home?" light when at work. Whenever I think of it, I imagine it just ready to burst into flames and turn the house wiring cherry red hot. I have decided to replace it with this, of which I have ordered one on sale. http://www.ebay.com/itm/221926067078 Now to see if it gives off RFI as well as light. I will have one more if that is not the case. The only experience I have had with LED lighting is the headlamps of my MINI. I am impressed. All the lighting on that MINI is LED, even the "welcome lamps." I might try some LED's in the bathroom fixtures and see what happens. I am not a fan of CFL's under any circumstances. The Led's are getting bright and color correct. The bath might be a good starting point. The wife wants a set of LED bulbs for the headlamps and foglamps on the Tahoe. They are lots brighter. I found an LED bulb with a WIFI sensor and an app for your smart phone. With this application I can turn the light on and off at my farm house while I'm gone. This will help change the light pattern a little better while I'm gone. A silly question but how do they work on a dimmer? jerryhawthorne wrote: A silly question but how do they work on a dimmer? They make a dimmable and non dimmable bulb. They have versions now that do. I imagine they have incorporated that feature into their driver circuitry You need to go to one of the big box stores for the particulars. MEZLAW wrote: I found an LED bulb with a WIFI sensor and an app for your smart phone. With this application I can turn the light on and off at my farm house while I'm gone. This will help change the light pattern a little better while I'm gone. I like this idea. I'm gonna look into this for when we are away. Might also be good to turn on the outside light too for when we pull into the yard. I have always felt in the back of my mind, that seeing an outside light on is usually a sign of an empty place. I saw this in Lowes. Tomorrow I will stop by and find out who makes it. I had some of those halogen work lights that have the tubes that are about 4 or 5 inches long. They were great lights but they blew the bulbs a lot then the wiring burned up. I wound up putting them in my shop to collect dust. But they are so handy I wanted to fix them somehow. I had a box of about 12 new porcelain light sockets. I looked and they would fit in these halogen cases. I gutted it and put the new sockets in them. I tried a florescent but then tried a LED. That worked great, not as bright as the halogen but good enough to use. Now I can use those lights again. I have a theater light from the 40s I might add one of the sockets to so I can use it in my outside workshop. It's nice when you can bring back something that was too good to throw away. I imagine that bulb will give off good bright light since it uses the SMD type of LED's. I've seen little flashlights with those type of bulbs and those suckers are damn near bliding.. lol. They should also last a very long time, much longer than standard LED bulbs. The only thing I see odd about this bulb is the amount of wattage it uses. That is an awful lot of wattage for LED. 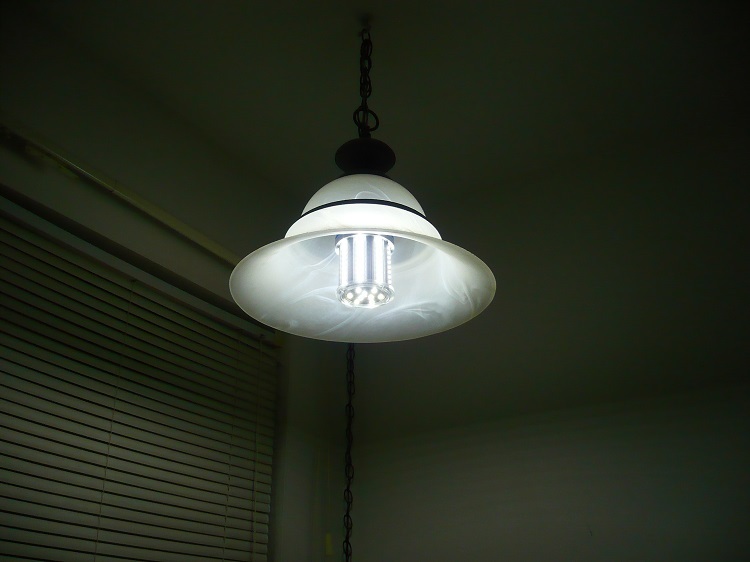 Usually an LED bulb used to replace a typical 60 or 75 watt incandesent is only 6-8 watts on average or about half of what a CFL would use. This bulb is 2800+ lumens and likely designed to replace a 200 or 300 watt incandesent and may be overkill on light output indoors. It was probably meant for outdoor fixtures. Look up the corn (radial) LED bulbs on Ebay. there may be something that would be a better compromise between cost and output available. I used the lumen figure on the CFL bulb it is to replace. It is about a 4x5 cylinder. A big light. It lights the dining/kitchen and living room. on it. It lights the inside of the truck like a 300 watt light bulb. No heat and little draw. The 48 LED one is out of stock. this one is the only one near it. 75X11 wrote: Look up the corn (radial) LED bulbs on Ebay. there may be something that would be a better compromise between cost and output available. I used the lumen figure on the CFL bulb it is to replace. It is about a 4x5 cylinder. A big light. It lights the dining/kitchen and living room. I've browsed for them in the past when they were still a bit more expensive. That is just quite a bit lumens and some CFL's have more light output than the incandecents do. If you are lighting 3 areas with one bulb, then you may need a bulb that bright. I just can't imagine putting it in one room. I bought a bunch of 100 and 150 watt incandescent bulbs on eBay for my photography and around my house. I hate LEDs. The cheap ones won't dim and I have dimmers everywhere. And the light looks funny. I mostly have CFL's, mainly because I hate changing light bulbs. I have 7 and 9 foot ceilings in my house and changing light bulbs isn't always exactly easy. My electric company has a deal with WalMart to where they provide a pack of 4 13W CFL's for 88 cents. They're not the greatest bulbs but they last 6 months to a year most of the time. My new bulb arrived last night. It is a cylinder about the size of a Progresso soup can with the screw base fairing. It gives a correct white light and puts no RFI on my consoles' SW or Broadcast spans. I've run it for about an hour and a Half and it heated up to about 80 to 90 degrees. I was surprised that in comparison the CFL looks almost amber. The CFL also runs Much hotter, with more UV and IR output. That is a good size light bulb. Isn't that quite hot considering L.E.D's aren't supposed to really generate heat? I know CFL's are going to run warm since they are basically full of a gas. I thought that was relatively cool for such a large device. I replaced ALL of the lights in my house with LEDs. I was especially glad to get rid of the 48 inch fluorescent tubes in the garages. The LED bars work MUCH better there, and don't burn out a tube every 5 months. And yes, I really like the fact that I can pick the type of light best suited for the environment (paint, furniture, decor). The savings in energy costs is just a boon. Here is a picture of the bulb. It is much brighter than it appears, but you can see the segments.